We are heading right into my absolute favorite time of the year—Christmas! 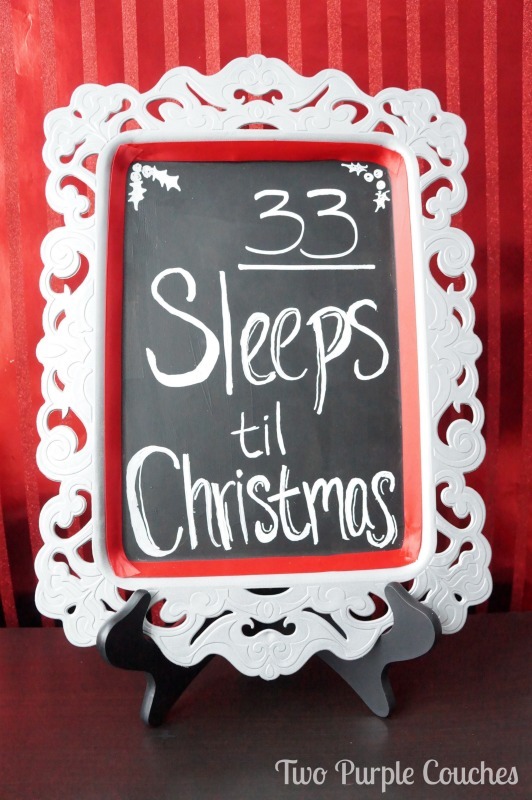 And what better way to get into the holiday spirit than with a fabulous blog hop between 31 talented bloggers? 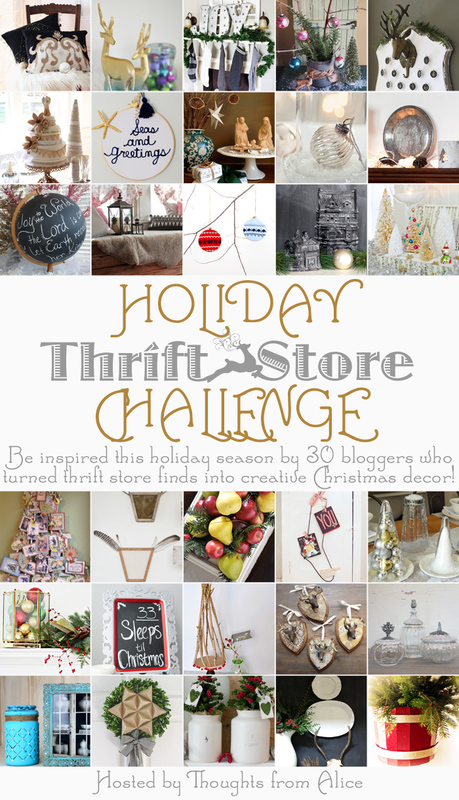 Well, how about if those 31 bloggers share ideas for making over thrift store finds? Sounds pretty awesome, right? Right! So let’s dive right in! As part of this fabulous event, dubbed the Holiday Thrift Store Challenge, I’m sharing some very simple Christmas decorations that can be made from items found at your local thrift store! I have to admit that I don’t thrift very often, but after rummaging around a local store to find items for this Challenge, I may go more often! My creative wheels were going into overdrive as I was walking up and down each aisle. 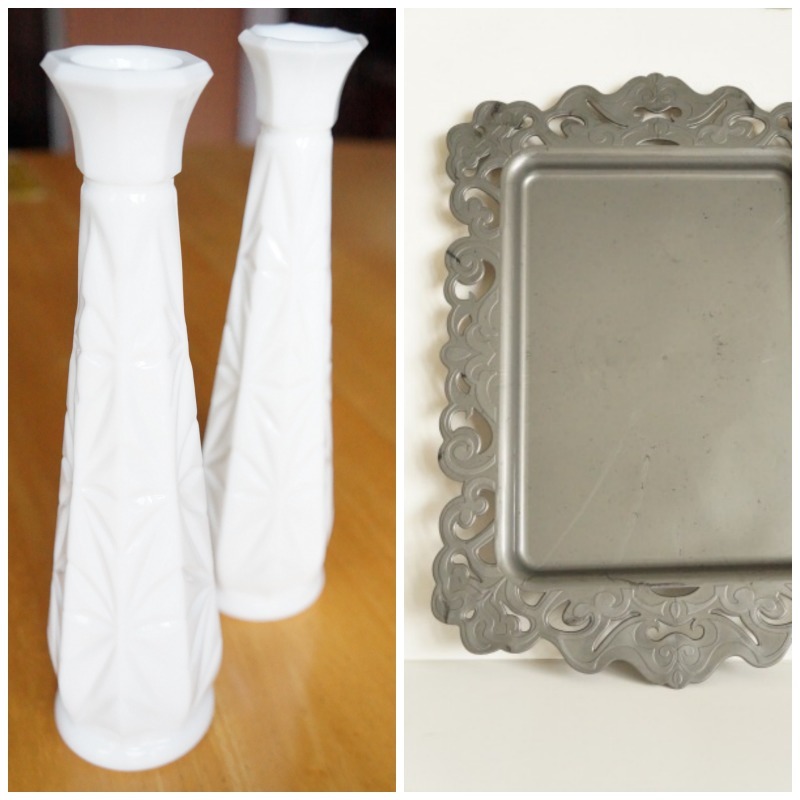 A pair of milk glass bud vases and a grey plastic tray. The milk glass vases are engraved with a pretty starburst pattern, and I thought it’d be neat to accent it. So, I turned to my trusty gold paint pen (seriously, have I declared my love of paint pens enough on this blog?? I should write a book dedicated to the awesomeness that are paint pens!) and began filling in the lines. I started at the bottom, debating whether or not I wanted to cover the whole vase, but after I got going, I just couldn’t stop! And voila! What do you think? I think the results are beautiful! The milk glass looked fine as it was when I bought it, but gilding in the design with a gold paint pen totally takes this little pair to the next level! And guess what else I discovered? 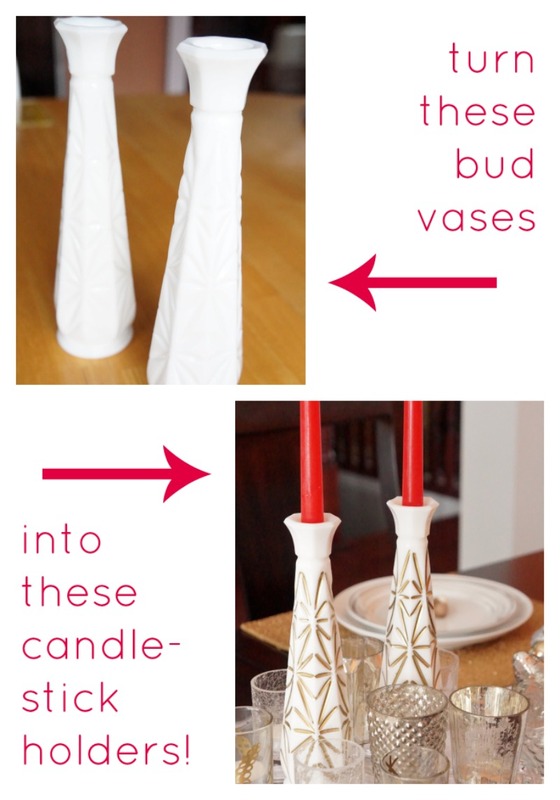 Yep, you can totally turn bud vases into candle holders for tapered candlesticks! You just gotta chop off the bottoms so the candlesticks will fit snugly! 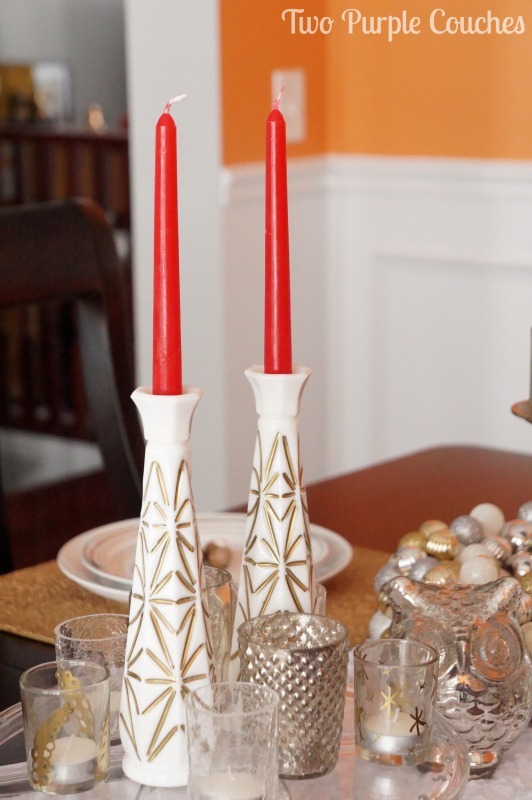 These candlesticks will be a lovely, glimmering addition to my holiday table. And I’m sure I’ll find a way to work them into my “everyday” decor as well (wink, wink). 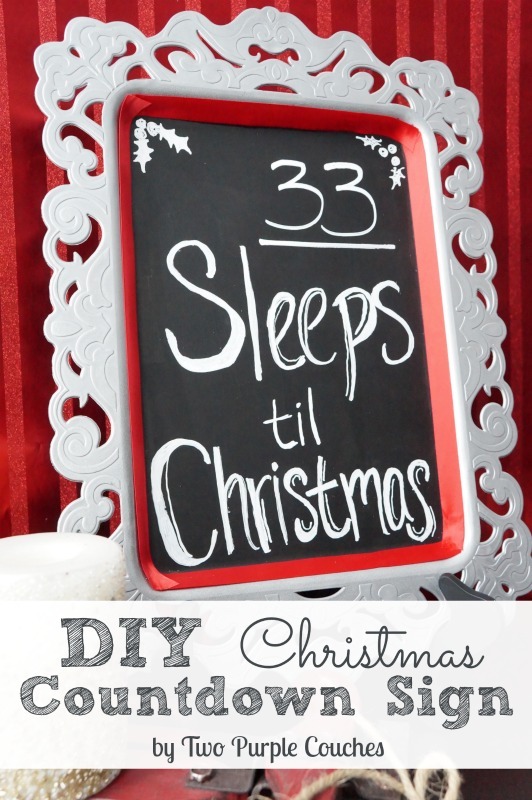 Are you feeling inspired to create Christmas decorations from thrift store finds? How about one more idea to keep the fun going? Remember that boring grey tray? 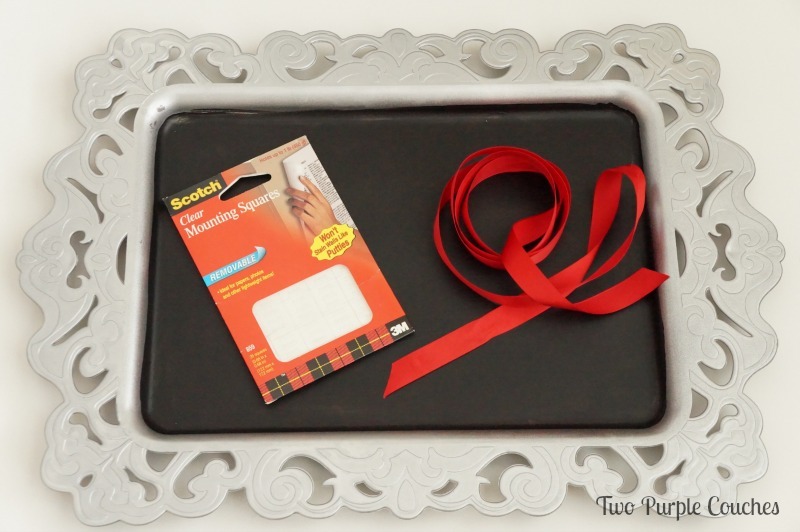 Metallic spray paint, a couple coats of chalkboard paint and red satin ribbon turned this blah tray into a cute “Sleeps til Christmas” countdown sign! I started by giving the edges a quick coat of Rust-Oleum silver metallic spray paint. Once dry, I painted two coats of chalkboard paint into bottom of the tray. And to finish things off, I found a roll of red satin ribbon in my ribbon stash. It need that bit of color, don’t you think? I was also toying with the idea of turning this tray into an Advent calendar, but it’s not a very long tray, and I didn’t want the dates to be small and cramped together. Want to check out even more ideas and inspiration for turning thrift store finds into beautiful Christmas decorations? Hop on over to any of these fabulous blogs, then come back here and share your favorite transformation! This entry was posted in Made It Myself on November 21, 2014 by Two Purple Couches. This is so creative! I would never have thought to turn them into candle holders! So awesome! So clever, I am sold on the gold paint pen! Love the chalkboard tray. WOW!!! Those vases turned candle stick holders are fantastic! Where did you get the gold paint pen? I want, I want. Looks so beautiful. I cannot believe how just the gold on those vases and turning them into candleholders makes them elevated to such a different level! You are totally rocking my world with this right now. The chalkboard is super adorable too! Thank you for taking the challenge with me and well just being so darn inspiring! Thank you, Alice! I am loving those vases-turned-candleholders too! Thank you so much for including me in this challenge. It’s been a blast! What a great idea! Love this! Hapoy Friday! I see those bud vases all the time. YOU MADE THEM LOOK AMAZING! Nate Berkus would be proud! I love the scrolly look to the tray, and how you transformed it! I never would have thought of the gold pen idea. Now I’ve got that one swimming in my head for a project of my own! Oh I REALLY love how those bud vases came out. The gold accents gives them almost a cool vintage deco look. Thank you Jennifer! I didn’t see the deco look until I read your comment, but you are SO right! so pretty! i love the added touch of gold! 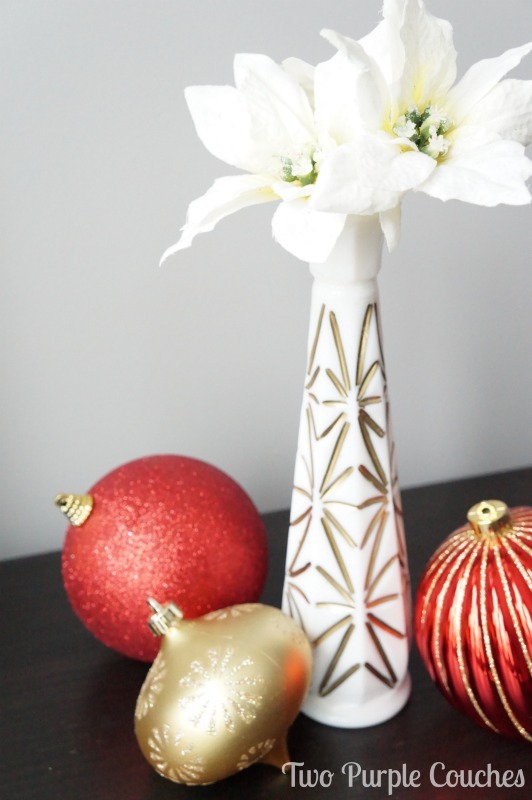 I had never thought of adding the gold to the milk glass vases…so clever! I love this look! And my son will love the sign, going to create one with him. Thanks so much for sharing! Love all the different ideas. Simple changes really gives them a whole new purpose.